There’s no question that the best-selling jewelry items are certainly chains, which are made of diverse precious or semiprecious metals. The number one choice of most consumers is the real gold chains. The fact is that despite you tendency to wear gold chain with or without pendant, the first one will always look stunning, since this jewelry item can be used either as a part of a set or as an independent piece. In case you’re searching for the proper gold chain to invest your money, you should take into account the number of important aspects. These aspects are quality, dimensions, style and price. As you may already be aware, all the gold items normally feature a stamp that shows the number of karat, specific for this particular item. The number of karat is very significant as it indicates the quality of gold, i.e. the exact number of parts of gold, which are present in this particular gold alloy. The most frequently metal stamps are 10K and 14K gold. These sorts of gold alloys provide a good value for money, being beautiful, durable and affordable. So, choosing 14k gold chain, you can be sure that it’s a life-long item. Considering the choice of chain styles available in today’s market, you can see that it’s quite impressive. The selection of styles, which you can see by Ultimate Collection, contains the most popular as well as the most durable modes of chain weaving, suitable first of all for daily wear and also to hold the weight of a pendant. 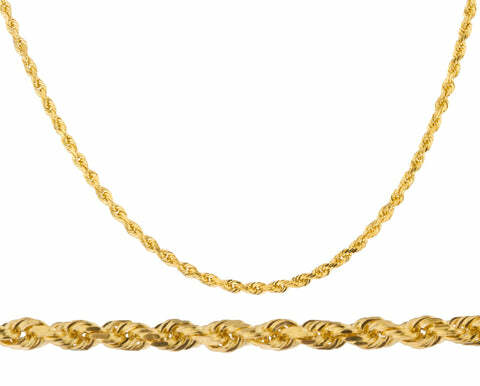 These styles include Franco, Figaro, Cuban, Link, Mariner, D-cut Rope, and Box styles of chains, each one of which offers the unique effect to the wearer. In addition, selecting the right thickness and length of chain, you can buy the proper chain, which will be suitable weather for men or women. In such a way, if you are looking for something classic and solid for men, you can decide on Figaro, Cuban or Mariner (also known as Anchor or Rambo) chain. On the other hand, if you are serious about how you can buy an elegant and thin gold chain for women – D-cut Rope or Box chain will be your best choice to get the desired effect. Finally, we shouldn’t ignore the price we are going to pay for a gold chain, since it’s expected to be the most competitive one. Bearing in mind this crucial aspect, we at Ultimate Collection offer the unbelievably cheap gold chains, which will be pleasant as for your eyes as your pocket.